Painting is a very mercurial thing. It’s a relatively simple act that has maintained relevancy throughout time and across most, if not all, cultures. For me, painting is like a collision of concepts as much as it is a combination of skill and material. It is where the creatively abstract and intellectually complex concepts of translation, illusion, allusion, and transformation find a nexus. I crossbreed different genres, eras, and conventions of painting into phantasmagorical anti-epics. I see my work as a kind of cultural aesthetic gumbo poured into its own reality, which is dedicated to honor the creative process. As multifaceted as painting is, it can be reduced to two parts: the “what” and the “how”. Firstly, “what” I paint, are goddess-like, saint-like women in situations or moments that seem to come from some bizarre myth or a story that you wish you’ve heard. I pull from a barrage of romantic and “painterly” eras of art that reflect our own: Baroque, Rococo, Ashcan, and Art Nouveau. I am influenced heavily by other creative mediums including film (all sorts of animation, 50's, 60'sclassics, and documentaries on culture), theater (Shakespearian, Musical, Avant Guard), music (blues, classical, hip hop, jazz, folk, and rock n’ roll) and literature (Twain, Hemingway, and Robbins. ) They all seem to add to the collision in one way or another. I love to make playful paintings - heartfelt yet irrational. They are like romantic absurdities or well-spoken riddles with no answer - anti-narratives. For instance, the popular riddle by Lewis Carroll, “Why is a raven like a writing desk?”. It’s a beautiful sentence and it’s a riddle you really want to see solved, but the answer is obviously never forthcoming. In a way, that’s the sort of image or scenario that I would like to create. It’s a balance between mystery and accessibility. My paintings may be seen as fun, funny, or pretty on the exterior, but this is just a tool to lure my audience into a world of mixed and matched myths and culture, literary gags, homages to great works of art, sexual metaphors, acts of overt futility, social commentary and to a place where there are no straight answers. Secondly, is the “how”. Much like what I paint, I also pick and choose techniques of painting that reflect a blending of eras. I favor an old world, brown-sauce painting style electrified by metallic hues and dynamic shifts in space, tone, and temperature, while employing acrylic’s remarkable speed for layering. No longer bound to “thin to fat” oil painting of the past, I believe that this new paint mirrors the speed of our culture. We are visually bombarded with slick images that come out of the ether of binary code. So much so, that it has led to a time when painterly paintings can be appreciated with new eyes. Eyes that yearn for the Wassabi perfection, eyes that long to see the raised lip of the bold brush stroke, or the radiant glaze with the presence of the artists’ hand still noticeable. I often muse over how the space in a painting might be approached or how a particular element in a painting may be expressed. I believe that the voice of the paint is just as important as the image it defines. In conclusion the “what” and the “how” lead us to the “why”. As an artist, I use painting like a lens to view the world. I find analogous principles and far reaching connections from our world to the world of paint. I believe a painter should try to paint as nature creates. So much so, that I’ve divided my work into the four elements, earth, air, fire, and water. These categories are not established on subject but, on the over all feel of the painting. This includes the way the paint operates, the character of the brush strokes, the push and pull of space and how the subjects in the paintings are interacting in their environments. The more I explore, the more connections I find. In the end, what keeps me painting is the idea that so much of a legacy and so many opportunities can exist in the tiny space between a brush tip loaded with paint and the surface with which it is meant to connect. Michael Pukac, Alabama born and Los Angeles based artist has quickly established himself as one of the more prolific live painters as well as made a name for himself by exhibiting constantly and relentlessly throughout the LA art community. His unique blend of seductive, classical imagery is cross pollinated with a witty, contemporary edge of subtle satire – all doused in reflective paint. His work basks in the land of unicorn powered zeplins, narwhal chases, underwater scuba adventures, DJ’s spinning on hot air balloon rides, and seahorse turntables. Close your eyes and swim into a steampunk Atlantis wonderland. Pukac creates playful paintings filled with romantic absurdities to complete epic anti-narratives that exist in the air or in the sea. Pukac was born in 1980 on the gulf coast of Alabama and grew up in the swamps. He started drawing at a very young age and already started selling small sketches to other students at age 9. He had his first exhibition at 19 and thereafter became one of the more recognized artists in Southern Alabama, selling out many featured and solo shows. He graduated from the Ringling School of Art and Design in 2003 in Sarasota , FL with a BFA focusing on painting. Thereafter, he has made painting a full time gig, traveling the country, making a living off of his fine art, murals, and illustrations. In the last 5 years, Pukac has hosted and curated art events, art walks, illustrated a series of children's books, live painted at numerous art and music events, and produced other live performances around the country. In 2007, he moved to Long Beach, California, along with his art manager Dicapria, and pretty much took to the ground running, participating in a few shows a month and live painting as much as possible. 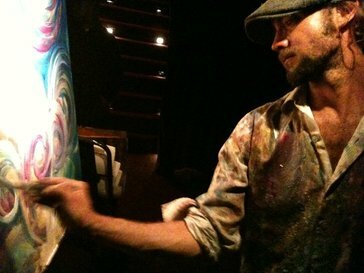 In 2011, Pukac won a trip from Art Battles to represent the US and compete in a Live Painting Tour through Paris, France and Barcelona and Valencia Spain. He has live painted at events with The Do Lab, Lucent Dossier, MOCA Contemporaries, Create Fixate, the Downtown LA Artwalk, Lucent Lamour, Lightning in a Bottle, Long Beach Museum of Art, Grand Central Art Center, Bergamot Station, Beyond Eden Contemporary Art Fair, Find Art Magazine, The King King, Club Nokia, The Fillmore in SF, The Kardashians, The Music Box, AC Supper Club, The Vanguard, and more. He has shown with such galleries as Thinkspace Gallery, The C.A.V.E. Gallery, La Luz de Jesus, Temple of Visions, The Hive Gallery, LA Municipal Art Gallery, Mondo Bizzarro Gallerie in Italy, Dialect, and more.